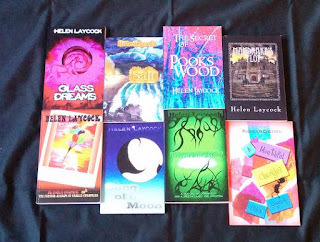 An Interview with Author Helen Laycock! Today, I'll be interviewing Middle Grade author and poet Helen Laycock! Helen writes all kinds of books, from short stories to full-blown novels, and she's always on the lookout for new ideas (as we shall see later on!). You can connect with her on Facebook, Twitter and Goodreads. Thanks for chatting with me today, Helen! To all intents and purposes, I look like an adult – but the truth is, I’m still waiting to feel grown up. As a child, I was described as ‘impish’, a moniker I thought I’d shaken off over time, but obviously not. A recent reviewer somehow recognised traits in me which, bizarrely, prompted her to refer to me (yet again) as an imp! I wonder a lot… which helps in coming up with ideas for stories. My background is in teaching, but now I’m a full-time writer. I have written twelve books and have work included in six anthologies. Here is the list of my children’s fiction in a nutshell. Mr Charlie Chumpkins and The Further Mishaps of Charlie Chumpkins (a bumper volume of two books in one) is a humorous story. A Mouthful of Chuckles is a poetry collection. My mystery/adventure books are really about how the main characters, always children, manage to tackle issues which may be dangerous or challenging, yet come out unscathed, and all without immediate adult input. What’s interesting is how they change as characters as the stories progress, finding a resilience, courage and confidence that perhaps they were lacking initially. I try to create suspense and twists so that, in becoming fully engrossed, the reader is able to identify with and champion the protagonists. Each book is completely different in terms of setting, character and plot. Mr Charlie Chumpkins and The Further Mishaps of Charlie Chumpkins is a completely different kind of book. It's about a minuscule man that a little boy, Sam, finds living under his bed, and all the calamities that befall him in the big, wide world. As I had so many ideas for adventures, I combined two books into one, hence the long title. I put together lots of funny poems for A Mouthful of Chuckles. This is an illustrated collection. All my books are suitable for children around the age of 8 and upwards. There is no bad language, or unsavoury behaviour in any of them, although there are 'baddies' and occasional mild peril! I could write an essay to answer this question! For each book, there has been a nugget that has sparked an idea. I’ll give you a few examples. Sometimes, it will be a scene or vision in my imagination. In Glass Dreams, a circus mystery, I ‘saw’ a ramshackle caravan in the woods and wondered why it might have been there. Working it out led to a great idea for a story. I think Salt was inspired by a trip to the Cornish coast, a place rife with legends of pirates and smuggling. I named the fictional setting Pirates' Cove. Mandrake's Plot came about when I imagined a grotesque-looking figure and decided that he would be the caretaker of a strange school. Then my job was to figure out why it was so strange. My next vision was of two girls meeting on a train, having missed the start of term, and that scene became the opening to the story. The setting I chose for Song of the Moon was inspired by a residential road near my home. Whenever I walked past, a house caught my eye, and this became the home of the character Mrs Moonsong. With my most recent book, The Secret of Pooks Wood, I happened to catch sign of a painted wooden sign on an old gate as I drove past. I didn’t really get a good look, but I thought it said ‘Pooks Wood’. By the time I had finished my journey, I had the entire plot mapped out in my head and couldn’t wait to begin. The character of Charlie Chumpkins popped into my head after teaching a poetry lesson at school where the children had to describe certain things whilst imagining that they were tiny as ants. It made me realise how difficult life would be for someone that small. The child heroes/heroines present themselves as soon as the plot takes off. I see them in my mind’s eye and quickly develop a context for each one which I add to as the story develops. Hattie, in Salt, a seaside mystery, is enigmatic, so her eyes and colouring were important to me. Often, the characters have a distinctive ‘quirk’; in Hattie’s case, it is the wearing of different hats. Of course, each child comes with a personality, too, not just an appearance, so Hattie has an uncanny aptitude to communicate with animals, as well as an inexplicable perception and knowledge. Toby, her counterpart, is the younger brother from an ordinary family, who, perhaps, feels insubordinate, and a little intimidated by his elder brother at home. He can now shine with his new friend in this new environment. Mrs Salt runs the guesthouse and is obsessed with all things nautical. Great Aunt Win with her pet rat, Rufus, is a bit of an eccentric and old Mr Tinegar is a most wise and interesting ally. Jake, in Glass Dreams, is a loner, a quiet boy who finds himself in a very difficult position. His strength is brought out when he meets Khala, a vibrant circus performer of the same age. Each child harbours a secret, but there is a very special connection between them which is revealed at the end. One of my favourite secondary characters in this is Cedric, the Irish dwarf, who performs his circus act with Audrey, his Chihuahua. Gino, the ringmaster, is the baddie. In Mandrake’s Plot, a boarding school mystery set in the Scottish Highlands, both of the main characters, Evie and Mia, are out of their comfort zone. They are very different, but, together, their personalities make them a force to be reckoned with. Originally, I wanted to make them resemble my own daughters, but characters don't always behave in the way you want them to! Mandrake, the mute caretaker, is not what you'd expect. Song of the Moon has as its main character a scatty girl called Izzy. She is quite clumsy and disorganised so you'd imagine that she's ill-equipped to deal with the disappearance of Mrs Moonsong, the white witch of the village... Joe, her older male cousin steps in, too. And I love the concept of twins! The Secret of Pooks Wood, a time-shift adventure set at an old manor house in a snowstorm, is one book where I make good use of twins – and it's not the only one! There are no baddies in this one. Uncle Alf is a benevolent old soul, and there are some lovely staff members, too. Squirt is an older boy who plays an important part in the plot, along with Stella and Bayonie. As soon as I could form sentences, I wrote. My mother kept a box of ‘treasures’ and in it were little stories, poems and letters I wrote as a very young child. At school, I was encouraged to contribute pieces to the school magazine, and I found that whenever there was a writing competition I was successful. Coming home with chocolate prizes used to make my day! In Sixth Form, where I studied English at A Level, my teacher encouraged me to keep a Creative Writing folder which she passed on to a college lecturer she knew. He sent it back with a wonderfully positive report and said I had talent. That was the first time I realised I could do something that lots of other people couldn’t. I kept writing for my own pleasure – stories and poetry, but it wasn’t until I began teaching that I wrote my first book. Now I spend a lot of time entering writing competitions, and have also written short story collections for adults. I get immense pleasure out of it. Although I often jot down ideas on scraps of paper wherever I am, I can only write – properly write – at my desk. I need complete silence and the luxury of time. Originally, I worked upstairs in the study, a very calm room with walls of lilac and white-painted wood which overlooks a wood, but now I work in the playroom-which-is-no-longer-played-in. The computer there has a big screen so that I can see two A4 pages side by side at the same time. I can’t bear working on small screens! I loved The Goldfinch by Donna Tartt. Such an intelligent writer. Her writing is truly masterful and I would love to be able to create that multi-sensory experience for my readers. I love suspense, crime and thrillers – Linwood Barclay and Tess Gerritsen, for example. I enjoy books where the plot does not follow a linear structure as I think it helps me, as a writer, figure out how to include plot twists. I think Roald Dahl is a fantastic children's author. His characterisation is so original and his plots unique. I was also a great fan of Enid Blyton as a child. However, on re-reading them, I don't think her execution as a writer was so great; her imagination, however, was. Oh, it's such a learning experience. Writers never stop learning. Each subsequent piece is better than the last. I think realistic dialogue is important. Dialogue brings a story to life. There's nothing more boring than pages and pages of narrative. See if your dialogue works by scripting your stories. I did that with Mandrake's Plot and it brought new life to it. Don't give speech tags to everything. They're unwieldy and unnecessary. Let the conversation flow, and try breaking it up occasionally with action. Don't say too much. By that, I mean always consider if what you're writing is relevant to the story. If not, cut it. Readers want pace. They want a page turner, and if they're bogged down by unnecessary details, they're likely to give up. Never write your first draft and think 'Job done'. It needs honing, and honing... and honing. It's always a good idea to give it to an impartial reader for feedback. Editing is crucial. And finally, don't give up! There are so many stories yet to be told. What, if anything, are you going to write next? Well, I have an idea for another light-hearted children's book. I've made a few notes, but I haven't started it yet. I'm going to need a nice big chunk of uninterrupted time and lots of chocolate and coffee to see me through to the end. I enjoyed this interview - lots of interesting tips! Thank you, Helen and Susan. Reading this interview is like peeking into the heart and soul of a passionate writer. I enjoyed all the answers to the questions. Thank you so much for your comment, Mario. I'm glad that my passion for writing comes across. It's what makes me who I am.